Every now and then, we all need a break from the hustle and bustle of day to day life. This, of course, leads to that age old question of, "Where can my family go where we will all have a good time?" Although you want to get the most bang for your buck, differing ages, interests, and needs may create challenges for you as you work to pick the ideal getaway destination for your family. So which is right for your group - a weekend at the best cabin rental that Helen has to offer, or a visit to Six Flags Over Georgia? A side-by-side comparison of the two options may help you to make the best decision for you and your loved ones. A weekend in the cabins - Spending a weekend in the mountains of northern Georgia provides numerous opportunities for entertainment. Many visitors enjoy taking advantage of the simpler pleasures that surround the comforts of their luxury cabin. Hiking, biking, fishing, canoeing, and tubing are all excellent activities for those who which to get closer to nature. Other travelers prefer a bit more action. A ZipLine tour, a day of kayaking the rapids of the Chattahoochee River, or mountain climbing could help to satisfy this urge. Six Flags - While visitors to the Georgia cabins tend to prefer simpler forms of entertainment, those who visit Six Flags are looking for something big and thrilling. Visitors to the park can spend the day screaming their heads off on the many infamous roller coasters, playing carnival style games for fun prizes, checking out shows that are scheduled at various intervals, or even stopping by White Water (Six Flag's adjoining water park), when it is seasonally open. A weekend in the cabins - Whether you are looking for the most spacious and luxurious cabin or are looking for something a bit more intimate and affordable, you will find it during your visit to the Helen area. For a family of four, the typical cost for lodging is in the neighborhood of $300 per night, plus taxes and fees. Because cabin features include a fully equipped kitchen, barbecue, and/or fire pit, you'll have the opportunity to save money by cooking your own meals. Parking is included with the cost of the rental. There are numerous free attractions in the area, including hiking trails, the History Museum of Sautee-Nacoochee, and The Gourd Place, but larger attractions like a ZipLine tour, horseback riding, or fly fishing lessons will vary in cost, so budget accordingly. Six Flags - General admission to Six Flags Over Georgia is $59.99 for adults and children at least 48" tall, $39.99 for children under 48" tall, and free for children under 2 years of age. Assuming that a family of four with once child above 48" and one child below 48" wishes to visit the park, total admission would come to just under $220. One day parking is then $20, or $25 for VIP. If you choose to visit the water park, you will need to purchase additional admissions tickets. Once inside, you'll need to plan on buying meals for the family, and possibly a souvenir from the gift shop. Allocating $25 per person for meals and $15 per person for souvenirs ($140), a ballpark figure for a single day at Six Flags would be approximately $400. 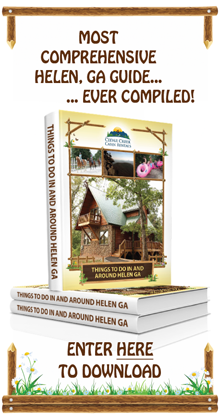 A weekend in the cabins - There is truly something for everything in the Helen area. Families with older children will be able to appreciate water sports, more adventurous hiking excursions, Geocaching, exploring the history of northern Georgia at the numerous museums and historical sites, taking a scenic trip on the BlueRidge Railroad, etc. Family groups that have younger children may tend to enjoy more low-key activities like hiking the easier access trails to nearby waterfalls, playing a round of Alpine mini gold, or panning for gold and precious stones at Duke's Creek. Six Flags - Generally speaking, Six Flags Over Georgia is more suitable for families with older children who are not afraid of the bigger thrill rides. Although there is a small area of the park dedicated to rides just for kids, the admission price is reduced for children under 48" inches for a reason: there aren't as many options for them. Parents who want to be able to enjoy the more extreme rides but have children who are too small may take advantage of the "child swap" program. While one adult rides, the other stays with the child, and the second adult gets to go on the ride on the next go-around. While this is convenient during the off-season, it can become frustrating for the little ones to wait in lines during peak season, without being able to go on the ride. A weekend in the cabins - When you choose to spend a weekend in a cabin, you have full control over how long you want to stay. While some families come for just one weekend, you can expand it into a longer trip, if you wish. There's so much to do and explore in northern Georgia, that there will never be a dull moment during the trip. Even after you go home, the experiences that you and your group share during your trip to Helen will stay with you for a lifetime. Six Flags - A typical family only chooses to spend a single day at a theme park like Six Flags Over Georgia. After spending all morning, afternoon, and evening on your feet, keeping an eye on the kids, and navigating through crowds, most people like to pack it up and head home. Although Six Flags can be a very fun way to spend time with your family, it can also be exhausting. Plus, the price of admission and parking is one-time only, so in order to return, you'd have to buy more tickets. A weekend in the cabins -The cabins are closer than you think. Helen is accessible from Atlanta in just 1.5 hours via the I-85 N and I-985 N. From the west, Birmingham is 3.5 hours away via the I-20E, and from the west, Columbus, SC is just over 3 hours away on the I-26 W and the GA-17 N.
Six Flags - Six Flags Over Georgia is located in Austell, just 12 miles west of Atlanta, via the I-20 W. Those coming in from the west, like the Birmingham area, can access the park in just over 2 hours via the I-20 E. From Chattanooga, TN, Six Flags can be reached in 1 hour and 50 minutes on the I-75 S, whereas those coming from southern Tallahassee, FL can get to the park in 4.5 hours on the I-75 N.
Where will you and your family be going for your next trip? Do you plan to book a stay at the spacious and luxurious cabins of Helen, or will you spend a day of thrills and chills at Six Flags Over Georgia?